You might not be able to afford a Bugatti, but if you hurry, you might be one of the 20 people in the world to own a Parmigiani Fleurer Bugatti Type 390 watch for your wrist. Bugatti needed a watch partner that could come up with a timepiece to match the power and the style of the Veyron and and the Parmigiani Fleurier Type 390 does this with great flair. The watch has a tubular-shaped movement and a worm screw that converts the transmission to a horizontal plane. Hence, though the time is displayed in a traditional manner, the figures are displayed on an inclined plane, thus making it easy to read the time even while holding the steering wheel. The cylindrical movement is powered by an “engine” that took four years to develop and the diameter is so small at 12.5mm that it is as small as the flying tourbillon regulator. The barrels, gear train and the regulating organ of the watch are mounted axially and the engine block can be removed from the housing just like the engine can be removed from a race car. This engine is powered by two series-mounted barrels and can store 80-hour of power reserve, which is quite good in view of its small diameter! The movement is regulated by a one-minute flying tourbillon that oscillates at 28,800 vibrations per hour. The watch has a rod clamp to adjust the time, instead of the four parts seen in a conventional watch movement. The curves of the watch are inspired by those of the Chiron. The case is made of gold and is articulated. It can pivot 12° for greater comfort while wearing and the large openings fitted with sapphire crystals offers a view of the intricacies of the movement and the open-worked dial. The Type 390 exhibits superb craftsmanship with meticulous finish of all the movement parts. 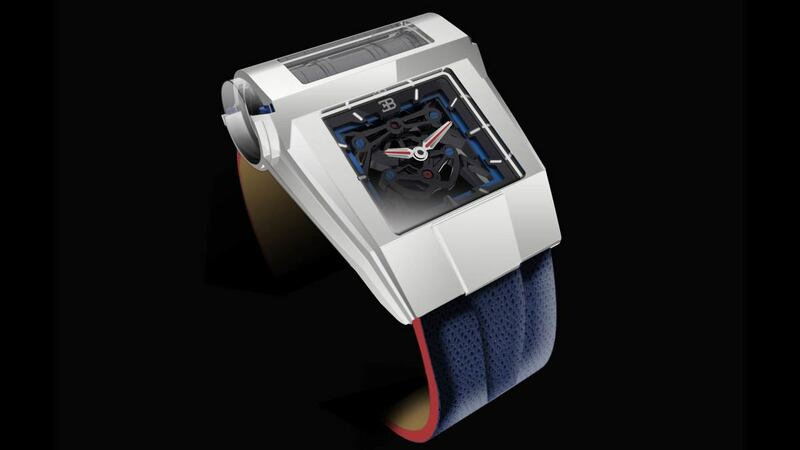 The watch is engraved with the Parmigiani logo as well as the EB initials of Ettore Bugatti. The dial has luminous hands and finely openworked Arabic numerals. The watch has a smooth alligator strap from Hermes and a gold folding buckle. The PF Type 390 is a truly spectacular watch with a cool design and many technological innovations like ultra-small ball bearings, a patented triangular coupling, the worm screw, and an articulated case. It is released in two limited editions of 10 pieces each.